Automation, artificial intelligence, new advances in analytics and technological change will bring huge disruption to Northern Ireland and Scotland over the coming years. Almost half of jobs in Northern Ireland and Scotland (49 per cent and 46 per cent respectively) have a high potential of change through automation over the coming years. This does not mean these jobs will disappear, but it does mean that they could change significantly. The skills system therefore needs to be ready. The population in Northern Ireland and Scotland will age drastically, to protect living standards we will need to see significant increases in productivity from the remaining working-age population. Improving the quality of work will be key to the skills system. We will need a fully-flexible lifelong-learning offer to increase participation among older workers, and increase employer engagement and investment. Curricula will need to be based on skills, attributes and a competency-based approach. The skills system will need to be an ‘early adopter’ of new technologies. The cost of transition will be large and should be shared between the public and employers. 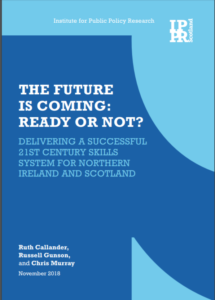 We have estimated that the additional skills investment required to aid transition, and prepare for automation, will reach £100 million per year in Northern Ireland and £250 million per year in Scotland by 2025. The report also made several tailored recommendations for Scotland and Northern Ireland.